On the first page of this book is a striking statement : "This is the first introductory chronicle of this fascinating genre". Yet dozens of volumes have been written on the Lied, on its composers, on specific works, on performers. Lorraine Gorrell's recent "Nineteenth Century German Lied" focuses directly on the subject as a whole. One of the useful features of this volume is its emphasis on 18th century and earlier antecedents to Lieder. Yet, conversely, this also is its fundamental weakness. No one disputes that the origins of art-song began earlier than the 19th century, but Lieder came into its own as a genre during the Romantic period and the cultural, social and political upheaval that followed. 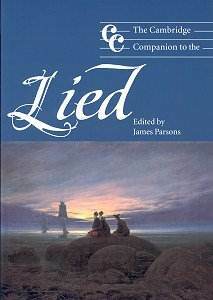 The absence of any deeper exploration of Romanticism and the development of the Lied in its prime skews the credibility of this volume as a balanced chronicle. The Introduction suggests that the term includes 16th century and other vocal music, and that the distinctiveness of 19th century song is arbitrary, stating that "the nineteenth century has garnered the lion's share of scholarly attention ... the complete history of the Lied remains obscured behind the lofty vistas formed by German song during its most dynamic period". (p.5) But if the 19th century was the "most dynamic" period, then surely it deserves recognition? If, as the writer says, Lied audiences were huge at the end of the 19th century, why not deal with the social and musical situations which made this so radically different from a century before? Schubert, Schumann, Brahms and Wolf take up attention for a very obvious reason � they are important. The author says he does not mean to "question the usefulness" of previous research, but by pushing the 18th century perspective so strongly, it does contradict the enormous amount of work that has been done by many serious scholars, on the character of Romanticism and song. To downplay the transition from the neo-Classical to the Romantic, and all the social and cultural upheaval that entailed, is to fundamentally ignore what made Lied the genre it became. Earlier forms of song contributed to the birth of Lieder, but Romanticism gave the genre its distinctive meaning. The editor, James Parsons, is a specialist in 18th century music. His chapter on the period is filled with fascinating information, and is a valuable contribution to knowledge on the period. However not all song is Lied. Gesänge, Minnelied, ballads and through-composed art-song are all forms of song, though appreciably with different connotations. Indeed, the 18th century interest in defining song may have roots in this very diversity. It simply does not follow that what was called "Lied" in the 18th century applies to the genre as a whole, for even then, fundamental changes were afoot. Romanticism was a fruit of the Enlightenment but it also represented a profound change in sensibility. It replaced ideas of benevolent Reason with a greater awareness of individualism, liberty and psychological complexity. It released a deep river of human experience, transforming the mental landscape of European thought. It changed the direction of politics, society and literature. The very idea of "Germany" arose in no small part from the wars of Napoleon. What we take for granted today as "modern" in many ways stems from the Romantic spirit with its irreverent independence and psychological depth. The influence of the "folk" movement of Herder, Grimm etc. went a lot deeper than the faux naive nature worship of neo-Classicism, for example. Amanda Glauert's chapter, "The Lieder of C.P.E. Bach, Haydn, Mozart and Beethoven", however, gives a convincing account of what these composers contributed to the development of the genre. Its focus may also be the 18th century, but it breathes with an understanding of its relevance of what was to come. Her analysis of Mozart's songs is particularly sensitive, but it is her study of Beethoven which surpasses. She concludes that even if Beethoven's innovations may not have appealed to the classicists, "they remain important to us as a warning against any tendency to limit or underestimate the scope of the Lied". It is a chapter to savour. Much could have been written about the relationship of poetry and song, literary values and the effect on Lieder. Surprisingly, in the chapter on poetry and song, conclusions are based on The Fischer-Dieskau Book of Lieder. But this is an unempirical method: Fischer-Dieskau made no claims to be comprehensive. The chapter contains many questionable assumptions such as that "modern" (period undefined) poetry "no longer speaks in a personal voice", that there were few settings of contemporary poets and that modern song is impossible because the link between song and poetry is broken. One quote suffices to summarise the flavour: "where we once collected folk song now we document the sounds of nature .... in such an age, poetry and song are a different kettle of fish" (p. 33). The chapter on song cycles is beautifully analysed by Ruth O. Bingham. Its focus is on 18th century cycle-like musical and literary forms, classified according to type. Yet, of fourteen pages, only one paragraph refers to perhaps the best known song cycle of them all: Winterreise. Two pages deal with the Müllers literary creation, but this is a book about song, not literature. Winterreise may be classified as an "internal plot cycle" but that does not address the musical and long term significance of this most unusual creation. Similarly, there is a suggestion that Beethoven's An die ferne Geliebte should not deserve the attention it gets because Kreutzer's cycles were more typical of their time (p. 116). But Beethoven had the longer impact. Because the chapter cuts off mid-century, it cannot cover the proliferation of cycles and cycle styles later in the period, and their importance in the development of "art music" as opposed to merely song. Nonetheless, most of the core essays in the main part of this volume are superbly presented, giving up to date information. Marie-Agnes Dittrich writes of Schubert and the innovations he made. If it reads somewhat choppily. It might be either due to translation or the "editing" mentioned at the end of the chapter. Jürgen Thym writes of Schumann, noting that his turn to song was a result of his "striving for (artistic) clarification", not, as suggested in an earlier chapter, an attempt to make money. He integrates Schumann's song work with his piano and other writing, showing his development of musical independence. He describes particularly well how the composer's literary inspirations influenced his music. This is another excellent chapter based on up to date research, and one to cherish. Also good is the chapter on the Lied at mid century by James Deaville. While I'm not sure that his assumption that the status of Fanny Mendelssohn and Clara Schumann eclipses other male composers, his point is to stress the variety of styles current in the mid-19th century. A welcome surprise is the chapter on the songs of Franz Liszt by Rena Charnin Mueller. Liszt is well regarded as a composer of Lieder (with many recordings, a curiously 20th century way of judging importance, used several times in this book). Still, a deeper analysis of his work is valuable. Special mention must be made of the superb chapter on Johannes Brahms by Heather Platt, so good that it could be a classic text. It comprehensively analyses Brahms' output, focusing on poems, form and syntax, declamation, word painting, harmony and motives. Susan Youens� chapter on Hugo Wolf is also very perceptive and thought through. Wolf's music is not charming and naturalistic in the manner of 18th century song, but demands literate and concentrated attention. Its sophistication includes acute observation of human life, and an exceptionally intense relationship with poetry. Also very useful is the study of Mahler and Strauss by James Zychowicz. It is reliable, systematic and a good reference. While Mahler's song output was small, it is integral to understanding his symphonic work. Moreover, Mahler's songs mark a transition from "traditional" Lieder to a more modern, complex form and are crucial to understanding the development of the genre. There are very useful charts showing the compositional history of Mahler and Strauss songs. Christopher Gibbs contributes an essay on how song and non-vocal musical forms inter-related. These central chapters provide a topical assessment of research into the genre. As a bouquet of essays, a "Liederkreis", or circle of songs, presented like a gift of flowers, they form the backbone of this volume. Their excellence makes the chapter on "modern" Lieder all the more disappointing. So much can be written on modern Lieder, an exciting development of the genre, whose genesis is very much integrated with modern music, society and poetry. But essential to appreciating modern Lieder is an understanding of the Romanticism and its relevance to modern culture. This is a basic handicap. For example, it suggests that since Lieder is a fusion of music and word "at the crossroads of nature" therefore, the modern world, so removed from Arcadia, cannot allow self knowledge (p. 273). But this is far more like the sublimation and impersonality of neo-Classical, 18th century form. Romantic Lieder deals with ideas like alienation, spiritual angst, death and psychological complexity, the natural landscape being a backdrop for ideas about the human condition. Its approach, with its doubts and anxieties, speaks directly to the 20th century and to modernism. Far from ending, the genre adapted and continues to adapt, because it expresses in many ways something relevant to the modern psyche. Furthermore, understanding modern song involves an understanding of modern music as a whole. For example, it is surprising to read an assertion that Das Lied von der Erde was an example of the symphony "overwhelming the Lied" when the opposite is often postulated. Similarly, it's stated that "it remains to be seen to what degree Lied was influenced by the type of song familiar in revues and cabarets", quite an odd statement when the writer himself writes of Weill, Krenek and Schoenberg. As the author himself says, this chapter is a "highly selective snapshot gallery" with arbitrary thumbnail sketches without analytical coherence. Alban Berg for example scarcely gets a mention, and non-German art song, much of it derived from Lieder, is simply ignored; Gibbs, at least, writes of Dvořák. A long discussion on Eisler shows little appreciation of his more important non-political music, or of his masterpiece, The Hollywood Liederbook, "the Winterreise of our times". Pierrot Lunaire is summarised in one sentence, without discussing what Spechstimme represented. Perhaps less emphasis on quotes from generalist sources might help, and more synthesis, based on music and social history. The book ends with the usual Cambridge Companion series format of final essays on "Reception and Performance". David Gramit's essay on the publication of Lied scores and their use indicates how the genre was able to spread so extensively. Graham Johnson's account of Lied in performance is a delight � wittily written and irreverent, yet full of real wisdom. He understands what motivates singers, what happens in performance and how that relates to musicological studies. The finest chapters in this volume are excellent, learned models that could become standard references. Some are truly outstanding, such as those by Glauert, Thym, Platt and Youens. These and many of the middle chapters will be the making of this volume, and its reputation. Nonetheless, with the depths, there are some serious shallows, on which the volume founders and runs adrift. The strange reluctance to engage with the impact of Romanticism is a misleading, fatal flaw. It also leads to a misunderstanding of the importance of modern song. This is a great pity, for so much else in the book is first class. The good chapters deserve a more worthy setting. If the volume aimed merely to be a "companion" to existing work, one might accept the weaknesses, but the volume does purport to be more. A study of Lieder without emphasis on Romanticism is like a description of a vehicle without its motor. Thus it is disappointing that this volume, despite such excellent inner chapters, does not, ultimately, live up to its premise.